The PCIC45 is a must-have accessory for using your smartphone and listening to music near water — by the pool, at the beach, in the tub. Just put your smartphone in the case, connect the headphone jack: you've instantly waterproofed your smartphone! Best of all, you can still listen to music and control your phone while it's in the case. It's completely compatible with most touch-screen phones (excluding iPhone 5 and some Android phones - please check the dimensions of your phone against our specifications.) The internal headphone jack allows you to connect your headphones on the outside of the case without breaking the waterproof seal. The PCIC45 comes with a carabiner clip and holding strap for easy attachment to nearly anything. 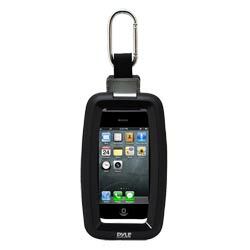 This case is IPX-7 certified for submersion in water up to 3 feet.